Stephen Sherry gave a presentation on the 15th Wisconsin Volunteer Infantry to about 50 Sons of Norway members at their meeting in Racine, Wisconsin on Wednesday, May 16, 2018. 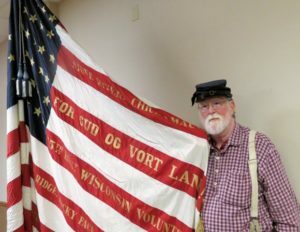 The soldiers 15th Wisconsin Volunteer Infantry were ethnically Norwegian, and known as the Norwegian ‘Bear Hunters’. The presentation was part of the Sons of Norway Syttende Mai (literally the seventeenth of May) celebration, which is Norway’s Constitution Day.